Christmas commercialism is refreshingly understated here in the Land of the Long White Cloud (New Zealand), compared to US standards. Thus far, the only prominent and heavily decorated "traditional" conical Christmas tree was Whangarei’s riverside public square. Rumor has it there’s even a nod to native plants and a recognition Christmas occurs in summer here in Southern hemisphere-based New Zealand. 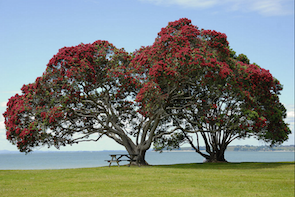 The red-blossomed pohutukawa tree (Metrosideros excelsa), purportedly marks the Kiwi Christmas season. As we made our last stop in Paihia Wednesday December 16th, before heading off the grid until perhaps New Year’s, told Wayne I hadn’t made any plans for Christmas gift-giving. When I asked if he was okay with that, he reminded me he still owes my for my birthday (last January) as well as our anniversary. Holidays are not such a big deal when every day feels like a precious gift. 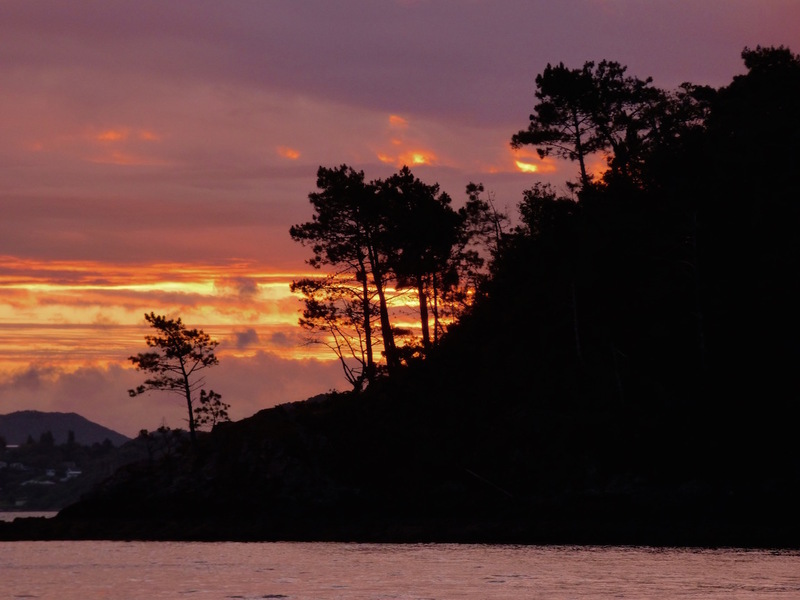 Being present, in the lifestyle we’re living for now – seeing the world via sailboat -- is a far greater gift than anything purchased. 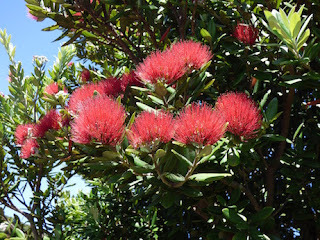 Long live the spirit of the upside down pahutukawa Kiwi Christmas trees with their fiery red natural blossoms and the simple joys of enjoying where you are for the best that it is. Thanks Wayne, for making it all possible in the Land of the Long White Cloud! Wishing you a happy holiday complete with whatever traditions bring you the most joy. may or may not make the cruiser's Christmas get-together there. We are currently cruising New Zealand's North Island between Whangaroa and Whangarei, where we expect to haul out sometime in January. This post was written for pre-posting December 21, 2015 while were briefly in wifi range while anchored in Whangaroa (S35.02.836 E173.44.514).